« How are you observing National School Lunch Week? I know I keep bringing up that MOMA show, Counter Space, and I must admit it is the only museum exhibition I have seen this fall. Nevertheless, there is much to discuss. Besides the Frankfurt Kitchen, there is an impressive display of over 300 iconic kitchen tools from the last century. I visited the show with my mother-in-law and we both admired the Chemex coffee pot which she remembered her mother using. Patented in 1941 by German inventor, Peter Schlumbohm, this simple glass coffeepot was designed to evoke the tools of chemistry (the Erlenmeyer flask and the beaker) in the service of making the perfect cup of coffee. Each glass pot has a small bubble on the base that tells you when it is half full and the pouring spout acts as an air chamber, releasing steam during the brewing process. The handle is indicated by a wooden collar with a leather tie and wooden bead. This Bauhaus-inspired coffee maker was purchased by the Museum of Modern Art in 1943 and featured on the cover of their bulletin on “Useful objects in Wartime”. It’s streamlined design was popular during this era and its use of glass (rather than aluminum or steel, which were rationed) made it downright patriotic. In 1959, the Illinois Institute of Technology named it one of the “100 best designed products of modern times”. That very same evening as our visit to MOMA, my mother-in-law treated us to a lovely dinner at Eleven Madison Park. When the dessert menus were presented, there were two types of coffee services offered: the Chemex and the Siphon. Although I am still intrigued by the vacuum coffee makers – having recently seen one at Intelligentsia – we couldn’t resist ordering the Chemex. Minutes later, a rolling cart appeared tableside with a set-up that looked like a culinary chemistry set. The coffee grounds were passed around to smell, the water heated to 200° and then very slowly poured into the paper filter. Of course, the coffee was delicious. A few days later, a box arrived in the mail and we opened it to find that my dear mother-in-law had sent us (you guessed it) a Chemex coffee pot! Complete with the wooden collar and little leather necklace – the design hasn’t changed since 1941. 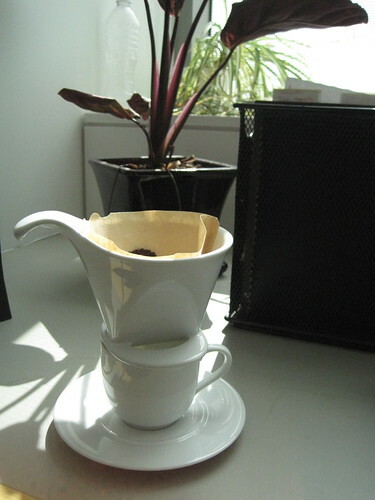 The Chemex is easy to use, just insert the paper filter designed for it, add your grounds and pour the water slowly. It takes awhile to figure out the right ratio and the process is on the slow side. While we are still using the old programmable Mr. Coffee on “school days”, the ceremony of it makes it perfect for weekend afternoons, preferably paired with babka. It’s relatively inexpensive and easy to buy (even on Amazon), I predict it will be the holiday gift of the season. 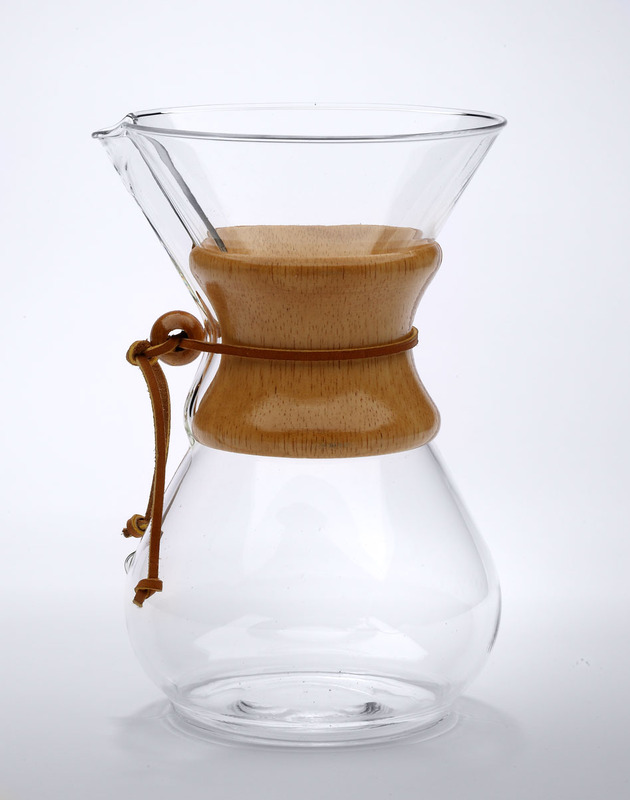 Are you experiencing a Chemex revival? 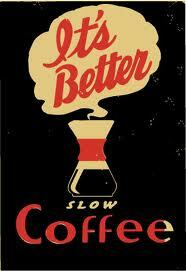 How do you take your coffee these days? Do tell! This entry was posted on October 14, 2010, 10:29 pm and is filed under inspiration, kitchen. You can follow any responses to this entry through RSS 2.0. You can leave a response, or trackback from your own site. My parents used this coffee maker when I was a child and I have not thought of it since. I can remember it sitting on our kitchen table and being about tall enough to inspect the varnish peeling off of it’s wooden holder from years of use and washing. Thanks!